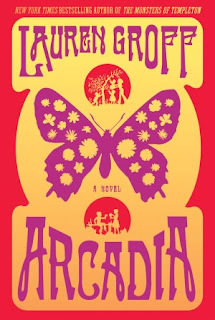 I've never not wanted a book to end as much as I didn't want Lauren Groff's absurdly good tale about a hippie commune in upstate New York to end. In four sections chronicling four distinct times in the life of our protagonist Bit, the novel is told in brief, dazzling, poetic snippets that are so alive, so evocative, you're almost surprised you can't actually taste what these characters are eating or smell what they're smelling. But you can feel what they're feeling — and that's one of the qualities of this novel that gave me that feeling in my stomach I can't explain, but only get when I've read a novel I really love. This is a novel you read (and savor) as much for the writing as for the story. Both are fantastic. We start in the mid 70s when Bit is five years old. Arcadia is in its formative years (like Bit), and we see the struggles and successes of creating a "utopian society," and the potential pitfalls of shielding children like Bit and his friend Helle, the daughter of the commune's founder/de facto leader Handy, from the Outside. Next we see Bit as a teenager, now in love with the tragic Helle — who bears more than a passing literary resemblance to Jenny from Forrest Gump. Helle has spent time on the Outside and has acquired a wild streak, now thinking that her and Bit's parents' dream of a communal utopia is misguided and naive. Indeed, as we move on to the final two sections — Bit in his late 30s in modern times, now with a child and sad story, and then Bit in his mid-50s in the future, caring for his aging mother Hannah (his symbol of constancy and love) — one of the constant themes of the story is how expectations or intentions (even the best ones) often clash with harsh reality. Life can be disappointing, even for the most noble. One of my favorite — and perhaps most heartbreaking — passages in the book describes Bit seeing a fat woman sitting on a bench in a train station, crying. Bit is appalled that no one will stop to comfort her, to ask her what's wrong. So he walks towards her, and notices a sign that says "crying woman" and a hat for donations; a weird piece of performance art. But Bit realizes that life is cruelest when it tricks you into sympathizing, but as a result of something that's not genuine. The inside flap blurb for Arcadia alludes to Groff as "one of our most accomplished literary artists," which sounds a little high-falutin, bordering on pretentious. But I can't think of a better way to describe this novel than as a literary work of art. It's absolutely incredible — not just one of my favorite of the year, my favorite in a long, long time. Five stars. Awesome. I have this one on my shelf and I will definitely pick it up now. It has been a while since I have felt the way about a book that you describe, but that is my favorite feeling. I especially like it when I find it from a surprising book. It had been awhile for me too - I was scared that feeling had gone away. :) And you're right, it's especially good when it sneaks up on you. I'm on the holds list at the library for this one. I should get it towards the end of this month. I do keep reading good reviews about it. I'm not going to read this post since I just bought it, but your first sentence is proof enough for me that I need to move it up on my TBR list. I love Groff's short story collection, so I'm glad this one worked out well for you. Will give it a go! This is the first time I'd read her, but she does seem like she'd be a masterful short story writer. Gonna have to find her collection - glad to hear it's good! I loved this too. I hadn't read much Groff before it, so I then picked up The Monsters of Templeton, which I think suffers a little in comparison. But--can't wait for her next book. My opinion was that she didn't have as much control over her material in Templeton. It's a pretty ambitious book. That said--she's a wonderful writer, even not at her best. 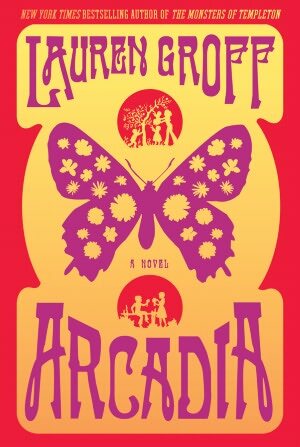 Maybe my expectations were too high after reading Arcadia. Quite a rave review. I will look for this one, thanks! Thank you so much for the great review of this book... and recommendation to read it! I'll have to get it and read it over Christmas - when I have some time to get my nose into some serious reading and kicking back in the Aussie heat over NYE and all those public holidays. Wow. This is why I (we all) love the blog community so much. This ostrich with her head in the sand had not even heard of this one, but it is definitely going on my list. Even if my reading of it isn't as chill-inducing as yours, I'll be glad to have met with such an artist. Thanks. I'd also heard about it from other bloggers and book colleagues - never having read Groff before, I was so excited to find out first-hand how awesome it is. I couldn't agree more with you about why the book blogging community is the best! Wow, what a great review. I wish I liked this book more than I did because the premise was so awesome. I'd say it was a solid four stars, though. My complaints are that Bit was just kind of ... saintly and superior, floating above everyone else's problems. Also, Helle didn't seem a very complete character to me, and what I saw of her was sort of generic wild girl cliche. Still, I appreciate what Groff did do, and can only say it wasn't quite up my alley. Completely agree with your review, Greg. Loved this one for all the same reasons. You're so right about that scene with the crying woman and the symbolism thereof. Definitely read DELICATE EDIBLE BIRDS and do give THE MONSTERS OF TEMPLETON a try. For me, Groff is 3 for 3.